The New Hampshire Motor Speedway Thursday Night bike racing series runs from April to September and includes up to 24 race dates. The bicycle race is at NHMS in Loudon, New Hampshire. Junior membership is available to persons 17 years of age or younger. Category 5 racers may not register for the A group without prior authorization from the promoter (please email sunapeeracing@gmail.com), or inquire at the gate during registration. A USA Cycling license is NOT required for a series pass or for day-of registration. The charge for day-of registration will be $10.00 per rider. The charge for juniors will be $5.00 per rider. The NHMS Bike Race series pass does not include the NHMS gate entry. The gate entry fee is $10.00 per adult racer, or $5 for junior racers and all spectators. A gate fee pass will be sold for the series for $125 (payable to NHMS), and will be available online and at the gate for purchase through April 18. There are bathrooms and showers inside the facility. Failure to pay the gate fee will result in a permanent ban from participating in the NHMS series. Pizza and Ice Cream Nights: Each month during the series, we have a race at which pizza or ice cream is served. This year we are very excited to partner with Baron’s Major Brands Appliances as the sponsor of pizza nights. The pizza/ice cream nights will be announced in advance, and are scheduled depending on weather and the course. Stay tuned for announcements! Most of the weekly road series races are held on Thursdays, although there are some "make up" dates usually on and Tuesdays – 6 pm to dark. Warm-up is from 5:15 pm to 6 pm. 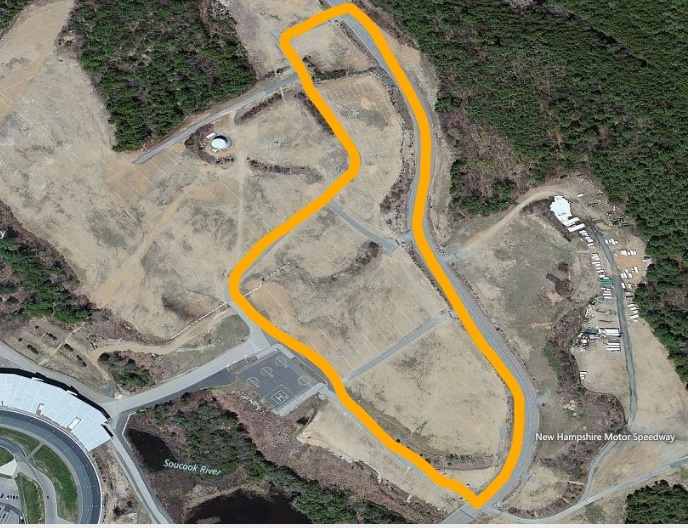 No Entry to the NHMS infield before 5:15 pm. All races start at 6:00 p.m., except for September dates which will start at 5:45 p.m. Please see rules and FAQ at bottom of this page. Question 1: What is the NHMS road series and how are the series winners determined? The NHMS series runs from April through August and series winners are determined based upon the total points accumulated during the season. Races are run as point races with every third lap counting as a point lap, except on the Magic Mile course which has a sprint lap every fifth lap. Points are awarded to the top three racers to cross the line on a points lap, with 3 points to the top finisher, 2 to the second place rider, and 1 to the third place rider. Double points are awarded to the top three finishers in the midpoint sprint and the final lap. Point totals in the A, B and C group are determined based upon applying a seven place ranking system to each race. The top seven racers for each race will get points (7,6,5,4,3,2,1). A racer who scores at least one point, but is not in the top seven racers for a race, will also get one point for the race. The top three riders based upon series point totals in each group receive a series prize at the annual awards ceremony in August. Races in September are not part of the NHMS points series, but are included in the series pass. Question 2: What rules apply to the NHMS road races? All USA Cycling rules apply to the series. You may not use aero bars and you must wear a helmet at all times when riding at the track. This includes riding in the parking lot. In addition to the USA Cycling rules, other rules also apply to the series. It is important that you understand these rules before participating in a race. Rule No. 1: When a faster field passes a slower field, the slower field is neutralized and no rider in that field may join or draft the faster field. If a rider fails to neutralize during a passing event, that rider will be disqualified and no points will be awarded to that rider. Rule No. 2: Riders dropped from the A and B fields should attempt to rejoin the field in which they started or join the field below the field that they started in a safe manner. Riders dropped from the A field may rejoin the A field or choose to join the B field, and riders dropped from the B field may rejoin the B filed or join the C field. Riders dropped from the C fields may rejoin their starting fields. Once dropped a rider may not contest the points laps by sprinting for finish points, nor may a dropped rider assist another rider in obtaining points. If you are dropped and rejoin a field, please try your best to stay in the middle/back of the field to avoid disrupting those racers who are contesting points. Rule No. 3: Slower riders must stay on the outside of the track. Rule No. 4: Aggressive or unsafe riding is not permitted. This is a training series and rider courtesy is expected. Riders who engage in aggressive or unsafe riding or who behave rudely will not be allowed to participate in the series. Rule No. 5: A gate fee must be paid for entry into the speedway. Failure to pay the gate fee will result in a permanent ban from participating in the NHMS Series. The Promoter reserves the right to discipline riders who engage in unsafe riding or inappropriate behavior. In addition, the promoter may assign a rider to a specific group if in the opinion of the promoter the rider should be riding in a different group. Question 3: What is the registration process? You can purchase a series pass for the NHMS series on bikereg.com or at the gate. To purchase a series pass, a rider must sign a series release. Riders who have not completed all the required paperwork will not be issued a series number. Series pass holders who have completed the required paperwork must check in at each event. A new release will not be required because the season pass release applies to all dates of the series. A check-in list for series pass holders is maintained at registration. Riders who fail to check in will not receive any points for that race event. Series pass holders are issued a number for each group that they wish to race in at the beginning of the season. The number or numbers should be maintained throughout the season. If the number is lost or misplaced, the rider should obtain a new number at registration, which will then be the permanent number for the remainder of the season. Please try not to lose your number. Riders who are not series pass holders must register for EACH race. To register for a race, a rider must fill out a release. Riders who anticipate racing in more than one race during the series should maintain the number that is issued to them and will use that number for subsequent races. Question 4: What field should I register for? There are three fields for the road series: A, B, and C. The A field is intended primarily for riders in Categories 3 or above. Category 5 racers are not permitted to register for the A field except with prior permission from the race promoter (send email to sunapeeracing@gmail.com), or inquire at the gate during registration. The B field is recommended for experienced riders with considerable strength. The C field is recommended for all other riders. Riders are permitted to race in different fields, but riders shall not be allowed to change their field for the oval course. A rider shall remain in the field that the rider has been racing for nights when the racing is on the oval. Question 5: What are the facilities? We are fortunate to have access to the facilities at NHMS, which includes bathrooms, changing rooms and showers. There is plenty of convenient parking.